Summer is fast approaching and so are this year's Australian music festivals - the perfect excuse to recreate hot hair trends and street-inspired looks with Taft FULL ON's first tailor-made range for women. Stand out from the crowd with a hairstyle that will last the whole day, meaning you can have fun in the sun and enjoy the music without worrying about your hair! Simple, yet effective, this feminine style is the perfect accompaniment to your favourite summer dress. Loved by the likes of Rihanna, this pin-up girl hairstyle lets you maintain a carefree look, whilst being completely in control. 5. Curl any fringe sections away from the face - and complete the look by using Taft FULL ON Freeze It Fixing Hairspray to hold it in place as you dance the day away! Attitude embodied in a hairstyle - mohawks and faux hawks are trending this season. Emeil Sande is the real deal, but if you have long hair, here are a few tricks to achieve the look without braving the chop. 4. Apply Taft FULL ON Booster Volume Mousse to the loose hair on the top of your head to hold the faux hawk in place. Pull the loose hair forward and starting from the back - backcomb the hair in sections so that it sits away from the crown. Creating perfect waves doesn't happen without a little effort! Both on and off the stage this timeless hairstyle is perfect for every occasion. 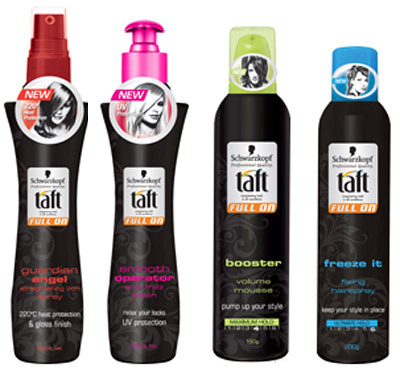 Best of all - with the help of the Taft FULL ON female range, it can be easily achieved.